We at Twin River Travel spend our entire summer introducing people to the beauty of Manitoba's backcountry. We take our guests through some of this province's most spectacular water routes and show them a true wilderness that is hard to find anywhere else in the world. There are many special places in this province, but to us, there's one that sticks out. Nopiming Park. "Nopiming" takes it's name from an Anishinaabe word, and translates loosely as "Entrance to the Wilderness". There couldn't be a more apt name for a place like this. Two and a half hours outside of Winnipeg, you know immediately when you arrive in Nopiming. The road turns to gravel, and the farms and pastures of the past 150 kilometres give way to rugged, rocky outcrops, gnarly trees, peaty swamps, and pristine lakes dotted around every turn in the road. Nopiming is special, this is a place that demands respect and a place that is both dauntingly wild, and beautifully serene. It's hard to put into words, but here a handful of photos from our trips that show why Nopiming is Manitoba's hidden gem. 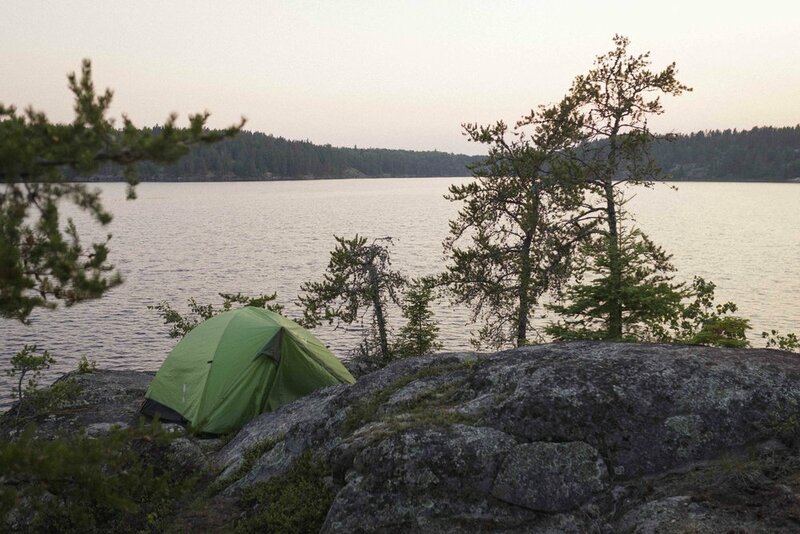 This photo perfectly captures why there's no better place to wake up than on a remote lake in the wilds of Manitoba. Nothing better than waking up, grabbing some coffee and heading out for a quick jaunt in the canoe. The sunrises are great, but sunset is a close contender for best part of the day in Nopiming Park. Setting up camp on one of our favorite sites, water on 3 sides, with great blueberry picking. Starry nights on our 2 night Seagrim lakes trip. Over 200 Kilometres from the nearest large city, Nopiming shows off the night sky to it's fullest. Entrance to the Bird River, on our 3-night Bird River Trip. Finishing off a day of exploring, sitting at the water's edge, watching the light fade. And the best part is, every day you get to pack up and paddle off to explore an entirely new part of the park! JoIn us in Nopiming this Summer! There's more than one way to explore Nopiming, but we think canoeing is the most authentic and adventurous. We offer two trips in the park. We provide everything from food, to equipment, to a ride out from Winnipeg. This summer we will have more than 20 departures on these two routes, pick yours below.